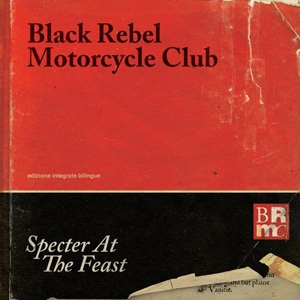 Black Rebel Motorcycle Club is back with their sixth album “Specter at the Feast.” The album is pretty great with a few flaws. “Specter at the Feast” starts off slow, then gets intense, then comes to a clean finish. The first four songs are slow and good but “Returning” and “Lullaby” don’t sound like the rest of the songs. These two songs sound more like they were written by The Brian Jonestown Massacre. It’s not that surprising though because the lead singer and songwriter, Peter Hayes, used to be in The Brian Jonestown Massacre. Not that it’s a bad thing though. The songs work perfectly with each other. After the first few songs, “Specter” gets faster and the intensity of the lyrics go perfectly with it. The ending of “Specter” is pretty slow but has the same rock attitude. “Specter at the Feast” doesn’t rely on catchy hooks or overproduced beats. Black Rebel Motorcycle Club made a straight up rock ‘n’ roll album the right way. At no point in the album does it leave you disappointed or wanting something else, except maybe another Black Rebel Motorcycle Club album. This album is great for fans of the band and people that want real rock ‘n’ roll.